Regina Clewlow is the CEO & Founder of Populus, a data platform that helps private mobility operators and cities deliver safer, more efficient streets. Dr. Clewlow has over a decade of experience in transportation, where she is a leading expert on innovations in public transit, shared mobility, and autonomous vehicles. In the spring of 2018, many U.S. cities experienced the latest wave of transportation innovation for urban mobility: the introduction of shared electric scooter services. Since the initial launch of private ride-hailing services (e.g. Uber, Lyft), the transportation ecosystem has experienced significant change. In many ways the public sector has been caught off guard by the rapid introduction of these new services, finding itself in a difficult position without access to information to help guide policy and planning decisions. At Populus, we believe that more frequent access to data and information can help both private and public transportation services work more seamlessly together. 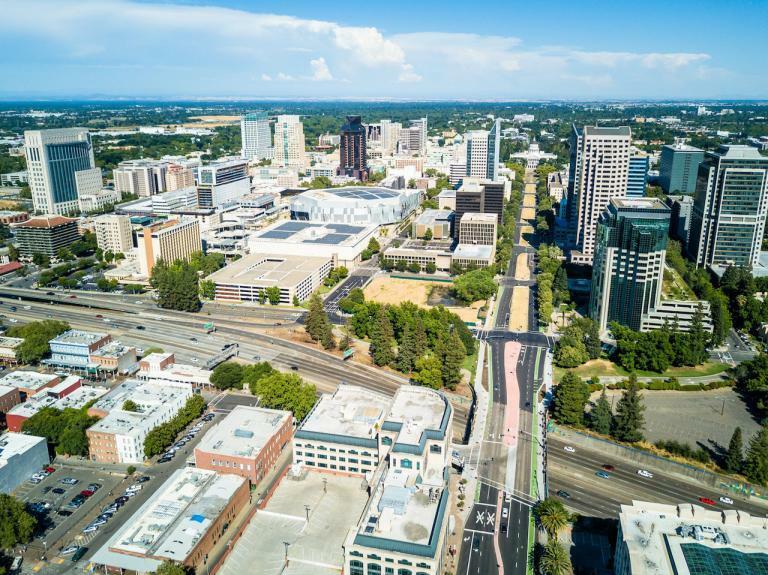 With information and transparency, the public sector can develop policies and plan infrastructure that better integrates private sector investments in urban mobility — improving transportation for everyone. Building on several decades of transportation expertise at MIT, UC Berkeley, and in the service of leading public agencies, the Populus team provides cities and private mobility operators with data and analytics to facilitate a safe, equitable, and efficient transition to the future of urban mobility. Perceptions of electric scooters: do people generally want them in cities? Although commercial shared electric scooter services have been available in U.S. cities for less than 12 months (less than 5 months in most markets), a remarkably large number of people (3.6%) report having used them. While there is variation across cities, as compared with the adoption of prior mobility services the overall number of people who have adopted electric scooters in such a short period of time is pretty remarkable. Based on our analysis and the limited academic research on the adoption of other mobility services, the adoption rates of mobility services overall has accelerated significantly over the past decade(see Fig. 1.) There are several key factors that have facilitated a more rapid rate of adoption for micro-mobility: 1) the widespread proliferation of GPS-enabled smartphones has more than doubled over the past decade; 2) traffic congestion in most U.S. cities is increasing and it can be faster to travel short distances of 3 miles or less using a bike or scooter; 3) the amount of private financing of micro-mobility has fueled the supply of these services — which has led to faster adoption. Figure 1. 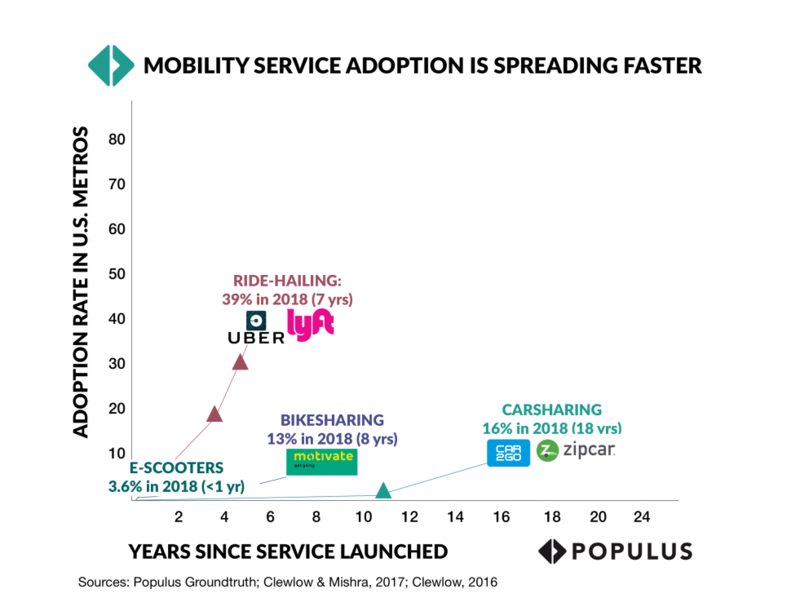 Mobility services adoption curves. 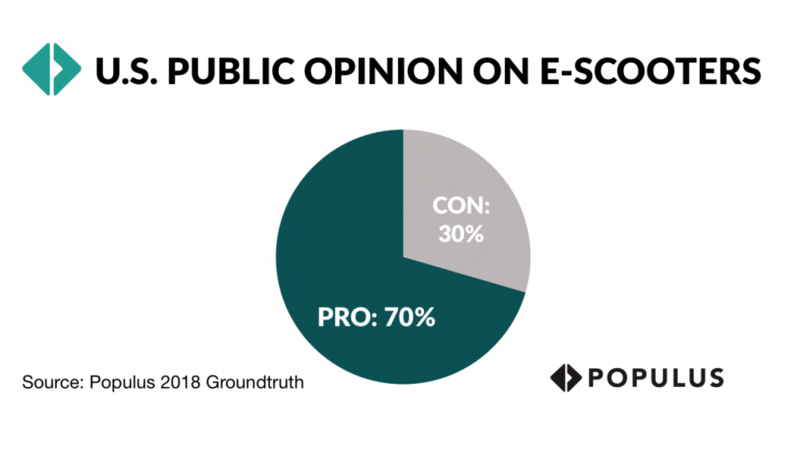 Based on our large-scale, representative sampling across the cities featured in this report, we find that a majority of people (70%) view electric scooters positively: that they expand transportation options, enable a car-free lifestyle, are a convenient replacement for short trips in a personal vehicle or ride-hailing service (i.e. Uber, Lyft), and are a complement to public transit. While further analysis of micro-mobility services is essential to guide transportation planning and policy decisions, overall, initial data analyzed from the Populus platform suggests that the vast majority of people want them in cities. Our data illustrated some variation in public opinion. In particular, San Francisco stood out as an outlier with the lowest amount of public support, although overall a majority of people (52%) view them positively. There are a number of complex reasons (mostly relating to housing and concerns about gentrification) that may influence the lower rates of support in San Francisco. A key takeaway from our study is that the policies, regulations, utilization rates, and attitudes of San Francisco may not translate to other U.S. cities. While prior station-based, non-electric bikeshare services have predominantly been used by men by a factor of 2x to 3x, this new study suggests that electric scooters may enjoy more support and adoption by women. 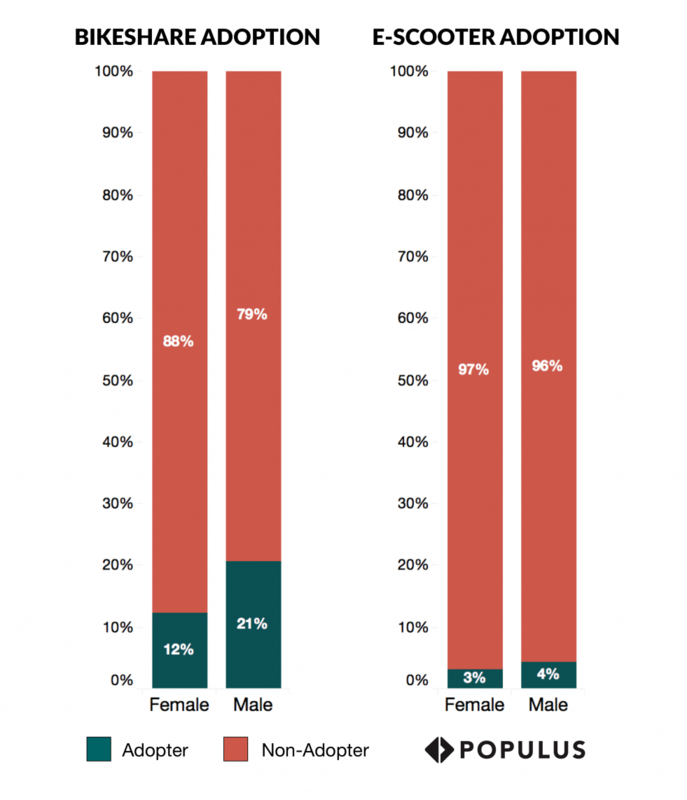 Our analysis of publicly available docked bikeshare data in the U.S. shows that 75% of trips are made by men, and 25% by women. This is not the fault of the providers, but rather it reflects a failure of the United States to invest in bike- and pedestrian-friendly infrastructure. There is currently greater gender parity in early electric scooter adoption; we share a few theories supported by academic research on why that might be the case in our full report. If U.S. cities can harness this new wave of interest in micro-mobility to improve bike and scooter infrastructure, they might make progress on closing the active transportation gender gap. Cities where women feel comfortable and safe riding bikes and scooters on the streets are ultimately cities that are safer for everyone. Our data also suggests that dockless electric scooters may also enjoy higher adoption rates by lower-income groups. Given that much has been written on the equity challenges of publicly-funded docked bikeshare systems, many have suggested that dockless micro-mobility could offer cities an opportunity to expand access to those who need it the most. The explosion of electric scooter services in the United States in 2018 took many by surprise — both in the public and private sectors. While many cities are working to determine how to develop policies and frameworks for managing this latest wave of transportation innovation, our study presents independent analysis on the adoption and perceptions of electric scooters to help guide mobility strategies. Without data, the public sector will struggle to craft effective transportation policies and plans that can help them achieve their goals of safety, equity, and efficiency as new private mobility technologies continue to evolve. However, with cooperation and access to data for monitoring progress towards public goals, cities have the opportunity to harness new private investments in mobility for a better transportation future. Maybe we could make streets safer for scooters, cyclists, and pedestrians? There’s lots of peer-reviewed research evidence that there is safety in numbers.